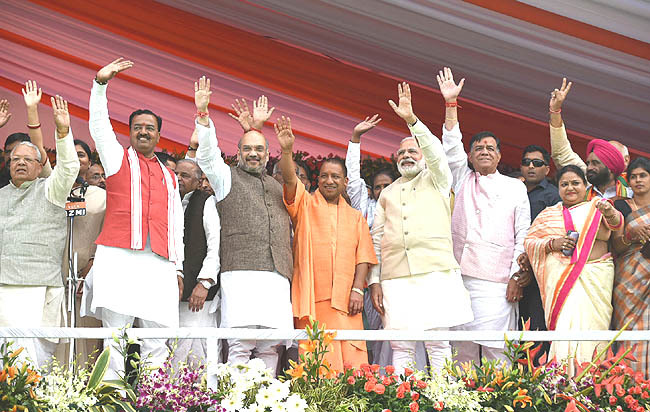 Did the Bharatiya Janata Party (BJP) desist from naming its Chief Ministerial candidate for UP before the assembly polls because it wanted to spring a nasty, or pleasant, surprise - depending on one's point of view - on an unsuspecting public? For some, the earlier deafening silence on a possible Chief Minister might have been a deceitful ploy considering that as virtually the sole effective campaigner, Narendra Modi gave the impression that he remains focused on development notwithstanding a few sops to the Hindutva brigade as in the 'kabaristhan-shamshan ghat' controversy relating to the Samajwadi Party's alleged partiality towards the Muslims. To critics such as these, the choice of Yogi Adityanath - perhaps the most trenchant of the saffron hardliners - as UP's Chief Minister is also a message to the BJP's core constituency of communal-minded Hindus that for all the talk about 'sabka saath' and 'sabka vikas' or development for all, Modi's heart remains in the right place. The jury will be out till it becomes clear whether the BJP is playing a double game. However, to give it the benefit of doubt, it has to be admitted that so far the party's emphasis has remained on development with even the Yogi articulating the key word, vikas, in his first few comments after his selection was announced while the central observer, Venkaiah Naidu, repeated it thrice to remove all misgivings. There is little doubt, however, that the choice of Yogi is one of the most audacious of gambles by Modi, far more than the demonetisation venture. If the prime minister can make a person, whose anti-minority hate speeches figure prominently in Google searches, to change his saffron stripes, it will be an extraordinary achievement. Perhaps Modi believes that if he himself can change from being a textbook fascist, as sociologist Ashis Nandy said, or a modern-day Nero, in the Supreme Court's view, or a person who "presided" over the killing of thousands, in Manmohan Singh's words, into an "avatar of modernism and progress", to quote Congress M.P. Shashi Tharoor, then so can the Yogi. It is also undeniable that if anyone can bring about such a seminal transformation, it is Modi. It's not only that there is no one else in the BJP who is capable inducing a metamorphosis of this magnitude, there has also been a manifold increase in Modi's clout after UP's overwhelming verdict in the BJP's favour. As the master of all he surveys at the moment, he can take the party and the country in almost any direction that he wants. It has to be remembered that in the last few months, Modi succeeded in clipping the Yogi's wings in respect of the latter's ghar wapsi and love jehad programmes. One doesn't hear any more of these provocative campaigns to reconvert Muslims and stop Hindu-Muslim marriages. Modi also virtually called the gau rakshaks or the cow vigilantes anti-socials. Considering that all these operations had the blessings of the Rashtriya Swayamsevak Sangh (RSS), the BJP's ostensible mentor, Modi's boldness in reining them in is obvious. In this respect, he is way ahead of Atal Behari Vajpayee, the tallest leader in the BJP before him, who shied away from taking on the RSS in a frontal confrontation. Even so, any effort to bring Yogi Adityanath in line will be Modi's biggest test. If he succeeds, it will be like inducing Hitler to embrace the Jews or Abu Bakr al-Baghdadi of the ISIS expressing love for infidels. If Modi fails, it will mean that the hopes of putting India on a fast track of growth will go for a toss since it will show that he is not serious about economic growth. Neither the domestic corporate sector nor the foreign investors will be amused by such backtracking. On the other hand, the taming of Yogi Adityanath will ring the death knell for all the saffron hawks whose hopes of ushering in their cherished Hindu rashtra where the Muslims and Christians will be second class citizens will be dashed. From this standpoint, such a fallout will ring the curtains down on a project of Hindu supremacy which the RSS has pursued since its inception in 1925. Much depends, however, not only on whether the mahant of Gorakhnath math eschews his longstanding anti-minority outlook, but also on whether he can function as an efficient Chief Minister. The selection of two deputy Chief Ministers shows that the BJP is not too sure on this score obviously because the man of "religion" has no previous experience in governance except that of running his math (monastery). For the BJP, sushashan or good governance in U.P. is indispensable because of Modi's promise of enhancing its growth rate since, as he said, India's growth is linked to that of its biggest state. Since UP is one of the BIMARU or sick states, the challenge is all the greater. Modi, therefore, can be said to have embarked on his most daring mission.